Alpana is currently the Deputy Chief Pharmaceutical Officer for the Scottish Government. Responsibilities include leading on policy and delivery of Prescription for Excellence and pharmaceutical care in all healthcare settings, and advising Ministers on pharmaceutical matters. She has over 20 years experience as a prescribing adviser and also works as an independent prescriber in Primary care running clinics for homeless patients to manage patients with long term conditions such as Diabetes, respiratory cardiovascular and for patients with drug misuse. She chairs the national group that produced National guidance for addressing polypharmacy, working to get this implemented as part of the core Scottish GP contract in a multidisciplinary approach and the Royal Pharmaceutical Society report on Pharmaceutical care in Care homes and is co-chair of effective prescribing group for Scotland. Alpana coordinates a subgroup as part of the European Union work on Active and Healthy Aging on polypharmacy and medications adherence. Alpana is leading a consortium across Europe for European health call project SIMPATHY, currently looking at the delivery of polypharmacy. 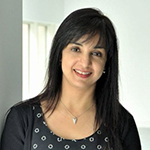 Alpana is a Scottish Quality and Safety fellow and an honorary lecturer at Strathclyde University, honorary senior lecturer at Robert Gordon University and teaches on the non-medical prescribing course at Napier University.